I hit the water with friends; Dave Jordan and Don Henry on Sunday. Bass was once again my main target. The weather was beautiful, temperatures in high 40's and low 50's all afternoon. 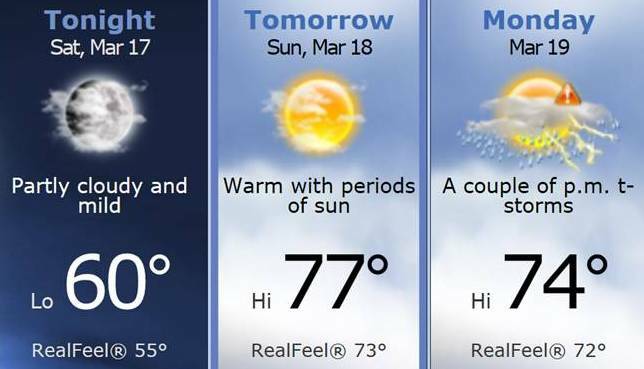 I assumed the water temps would be around the upper forties, however I was way off. 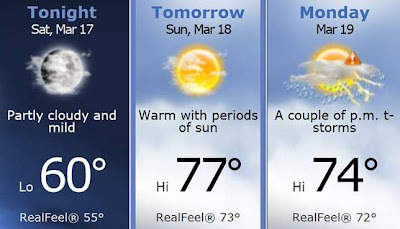 Temperatures varied from 50-56 degrees. I was hoping for cooler water, and "bunched up" bass for this outing. We ended up catching bass all throughout the water column. Some were as shallow as 2 feet, and others in 15 feet of water. The bass were scattered to say the least. I employed a three-rod arsenal for the day, my Quantum KVD cranking combo, Exo rod/reel for a spinnerbait, and the trusty EnergyPT and Accurist Texas rig pole. All three got worked over pretty good this day! Most fish did come on the KVD cranking rod, as the bass were wanting a slow crankbait retrieve. 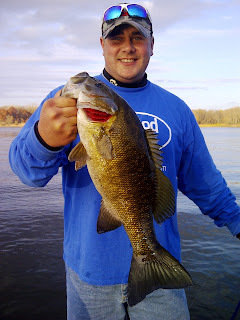 The Hot Rod Baits "Big Daddy" fooled a few bass aboard on this late fall trip. ﻿ A great day in the outdoors for me and two friends, and perhaps my last day in the boat this year, but i am hoping that Mother Nature will allow me one more time before my gears shift into ice fishing. I headed north this past weekend with friends, Dave Jordan, Rick Fisher, Brian Bowles, and Ken Lunsford. Our goal was to catch as many bass as we could in the two days we had to fish. Brian Bowles with a 3# 10oz SMALLIE! Saturday was a beautiful day, light wind, sunny and the temps hung around 60 degrees most of the day, after sub freezing weather in the morning. 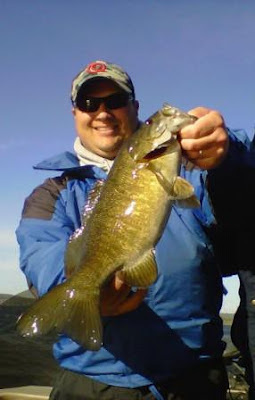 We caught a lot of bass that day, capped off by Brian's big smallie. It weighed in at 3# and 10oz, a true beauty! 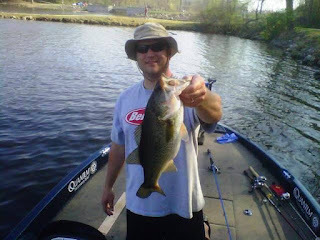 We caught bass, mostly smallmouth this day, on tubes, jerkbaits, crankbaits, and finesse tactics. At one point that day, all three of us in the boat had out spinning gear with finesse tactics around a harbor that was receiving high pressure form anglers. We caught about 10 largemouth doing this in a short amount of time too, it was great. Sunday was almost a day to forget, the wind blew terribly and forced us to areas of the river that were not productive. We manage to squeeze out a few bass Sunday, including a nice largemouth on a spinnerbait. A spinnerbait was the key on Sunday, as the wind told me to start throwing it. We also discovered a few new fishing areas on pool 4, that might come in handy on a return trip. It is always fun to explore new water and catch a few fish. All in all, a very nice trip with some good buddies, that included some great breakfast items and some awesome pizza in Pepin, Wisconsin. The season has officially changed for me. It's fall, and the tournament season is over, well, it's been over for me for a couple weeks. However, I still find myself on Monday's during lunch time wondering when I will be fishing next. It is always about looking at that next adventure, and those fish that I might catch. The past two weekends I have made it out each Sunday. Two weeks ago, with my two kids. They did awesome as we spent about 3 hours fishing a farm pond. 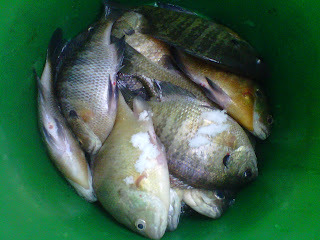 They caught dozens of bluegills and crappies, and one bass, which made my son the "Bassmaster" of the day. That made my day! I also had the chance to fish with long-time friend Dave Jordan for bass on another body of water that afternoon. We really found the bass lined up on the weedlines and willing to bite any bait that was presented slow, even swimjigs. ﻿﻿﻿﻿ This past Sunday I met up with my buddy Ken Lunsford. Ken and I have always been in contact with each other, because we have had ties with the same bass club. We have never fished against one another but have shared the boat a few times this year. We hit a lake and found a couple dozen bass willing to bite this weekend. 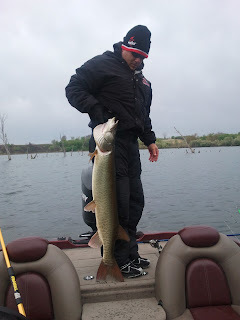 The bite was much tougher than the previous weekend, but we both knew that was coming, due to the HUGE cold front that passed through on Friday. 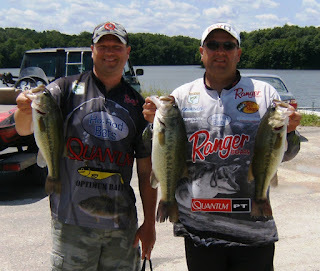 We did the most damage this day on crankbaits and again slow moving plastic baits and jigs. It is always fun to catch a few bass for fun, and the past two weekends is just what the "fishing doctor" prescribed. I hope to get out once every weekend until...well it's almost time to get out the ice fishing gear. 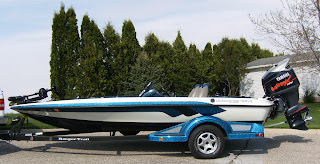 I had the boat out several time sin November last year, and hope to do the same this year. I guess that decision will come on Mondays' during my lunch time. Today led my partner Doug and I to 3-Mile lake in Southwestern Iowa. This was a the 4th tournament in the year-long series that we are competing in. We stood in 3rd place before the tournament, which was in our goal range of placing in the top 3 once the season was finished. Last weekend we spent about 7 hours on the lake looking for any sign of bass that were concentrated, or at least using specific areas of the lake. To put is nicely, we struggled, we only found three keeper bass, and only caught a few other short bass. Leaving the lake I was defeated...until I got a call from a friend of mine that was fishing a tournament on 3-Mile that same day. It was a struggle for almost everyone. This made me feel a little better coming into today's event. We were up at 2:30am to make the 2-hour drive to the lake, as we drove we figured out a plan to attack the lake. We also knew that rain was in the forecast all day long in the area, which normally helps the anglers catch more fish. Notice I said "normally"!!! 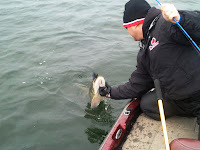 Our plan was a good one, the first stop we made, a shallow feeding flat and BOOM, Doug scores our first keeper bass. 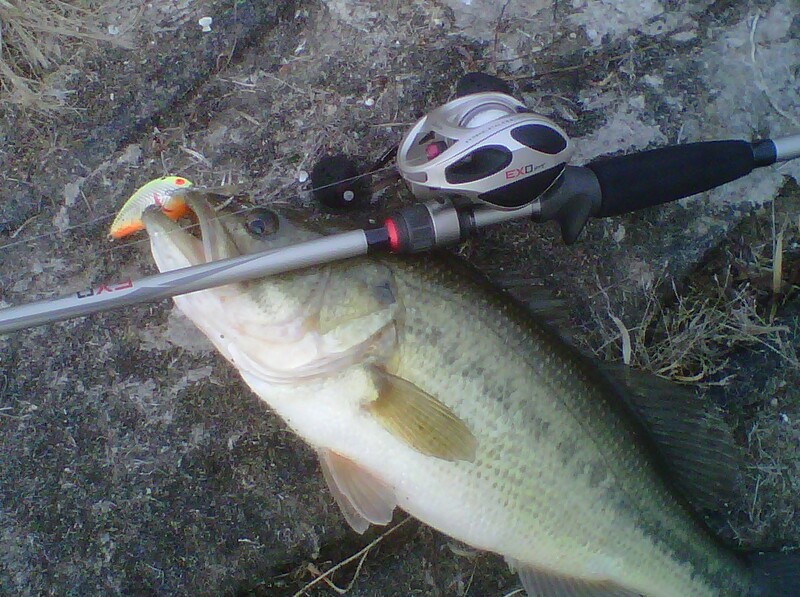 We continue in this area, and BOOM, I hook up with our second keeper bass on a buzzbait. Things are looking good! We continue to fish around the same feeding flat, and finally give up. We decide to head for a little deeper location, not too far away. Zero...then we go a little bit deeper along a channel swing...Zero...we continue to hit some standing timber...Zero. It was time to refocus...and refocus we did. We went to other areas in the lake that were similar to where we got a few bites early in the morning. This was our saving grace for the day. 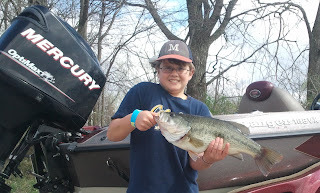 We hooked up on two more keepers on the day, and weighed in 3 keeper bass that were almost seven pounds. Fishing was tough, and I had mixed feelings as we put the boat back on the trailer. I figured we had bombed and given up a lot of points towards our goal of the top three in the "Team of the Year" race. Come to find out, many teams struggled, and we ended up in 6th place. Not as bad as I had thought, and it might be just enough to save our season, it probably came down to one little decision that we made on the water today. Belva Deer is the next stop in a few weeks to decide it all! The Tri-County Bass club held its 8th annual 4-man Bass Tournament this past Saturday. 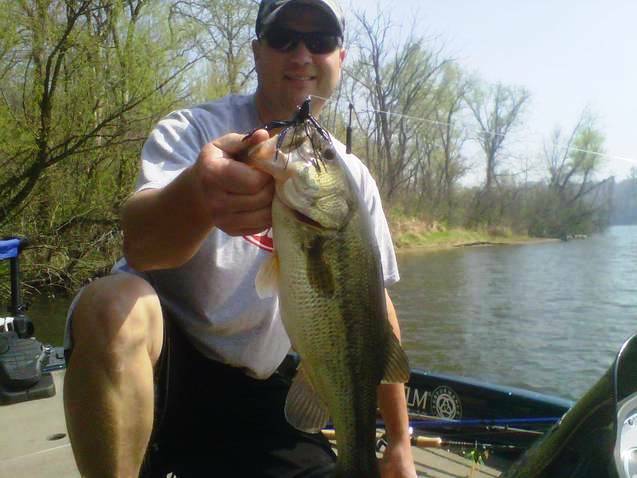 I have been a member of this bass club since 1999 while living in Marshalltown. It is a great bass club with a great group of guys. 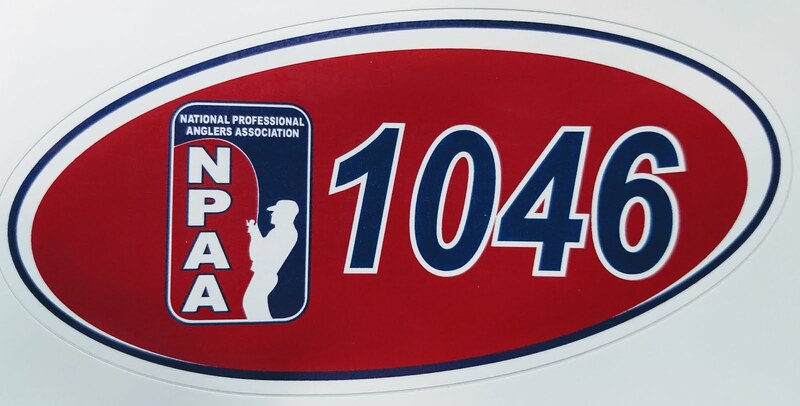 A few years ago, 2005 to be exact I came up with an idea to have a 4 person bass tournament. Those of you that have heard of bass tournaments know that this is unusual, and I believe it was the first ever in the state of Iowa. My friends and family have always said I have had some goofy ideas, and this was one of them I had back in 2005. The tournament is just like any other bass tournament, except instead of having just one partner, you have your partner in your boat, PLUS two other people on your team in another boat. Ideally you work together, call/text each other the "hot spots", or the "hot bait" of the day to compete against all the other teams. It has been a fun tournament to compete in. 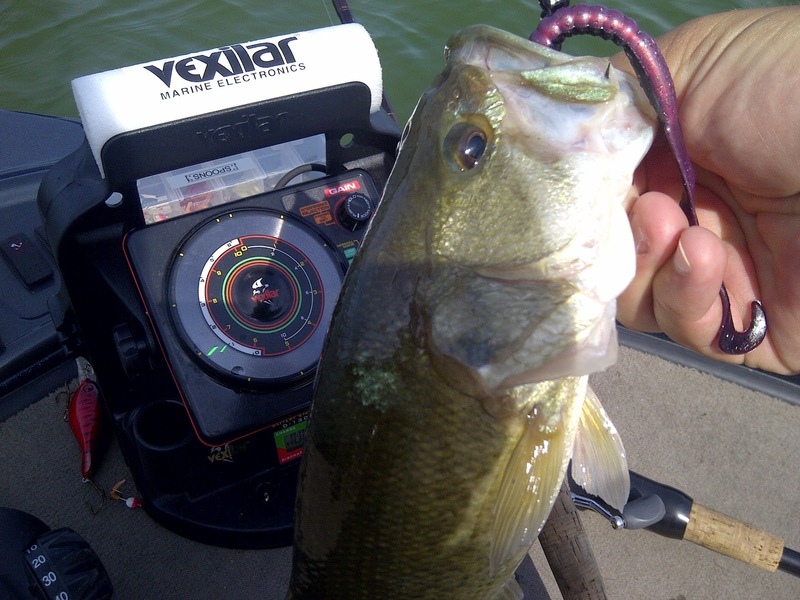 tournament using a Vexilar flasher and shakey head worm. I have always teamed up with other club members, and also coordinate the event each year. Last year, our team did our best ever, we placed 4th with 33.60# for 10 bass, and I also caught the big bass for the event at 5.20 pounds. We got the big bass award ($500) and about $400 for our 4th place finish. 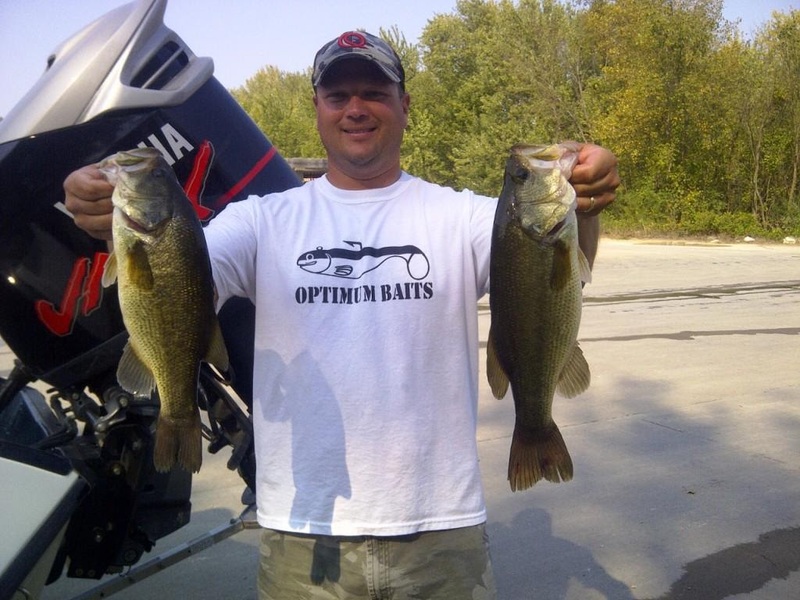 This year our team had high hopes as we fished the lake prior to the event, but had little success. This year, as the title states was a flop. None of our team members could really find those bass creatures on the day. All four of us fished hard, and caught numerous bass throughout the day, but as a team we only weighed in 4 bass, out of 10 possible. We just couldn't seem to find the keeper bass that day...a FLOP as I call it. A flop it may be, but I am a better angler because of it, and I will get back out there soon...you can't let one bad event get you down for too long. To close, I may sound like a Cubs fan for a few seconds, but "I guess there is always next year". My bass club here in Marshalltown had an event this past weekend at Belva Deer Lake near Sigourney, Iowa. I planned on fishing this event since the start of the year, for one reason, to check out a new lake. I had never seen the lake before, only read comments and posts on the Internet about it. It appeared to be a good bass lake, and I couldn't help myself, I "had" to enter. I decided to practice for the event on Friday, the day before competition, which can be tricky, because you don't want to catch too many bass the day before the tournament. I hit the lake with partner for the weekend, Eric. We haven't fished together for 3 or 4 years, so it was nice to share my boat with him again. We were on the lake about 5am Friday and I immediately went into my game plan for the day. At the end of the day, some of my assumptions were correct, while others were simply all wrong. I guess that is what practice is for! We were off the lake about 1:30pm and headed back to the motel for a break and to get our rod and reels ready for the tournament. key to a top three finish. Tournament day, up and on the lake at 5am once again. My plan for the day was to use topwater baits early in the morning in some shallow areas that we found holding fish on Friday. This worked out very well. 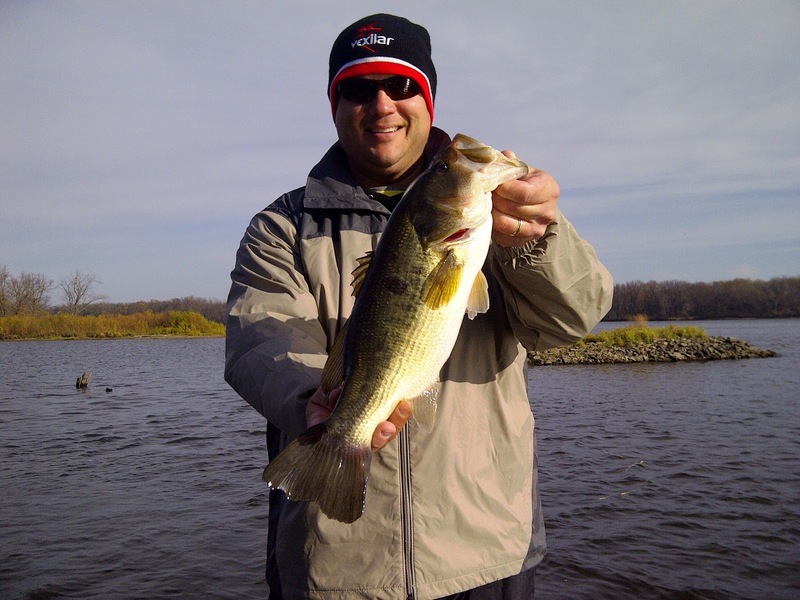 We caught about 25 bass using Pop-r baits. I had a limit of 3 bass in less than an hour and my partner had a nice keeper too. We then moved to some timber, which this lake is full of! We had certain sections picked out to fish, but nothing came in the boat long enough to help us. Onto the the next step, Carolina-rigging sunken islands. This is a technique that can be deadly in the summer time. 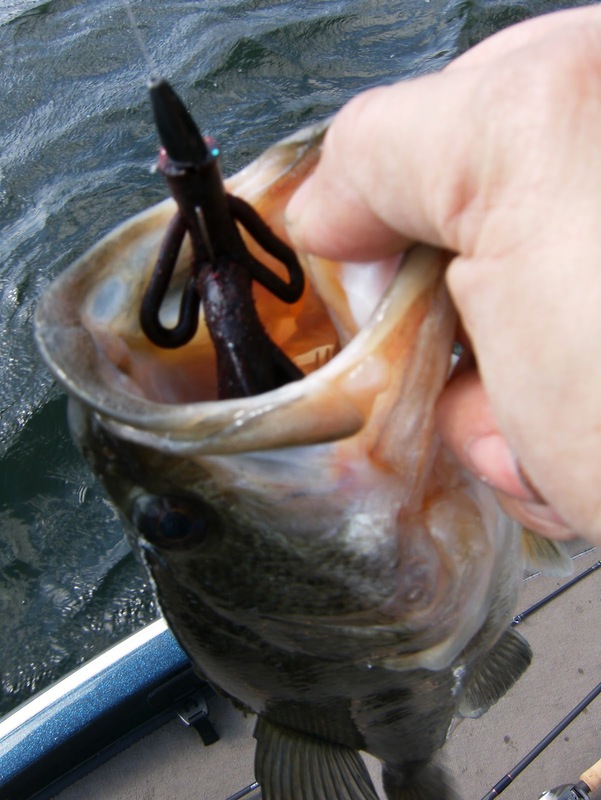 Bass move up and down the water column looking for food, and this rig can cover a lot of water and offer a bait very slowly to a bass. I was able to add some heavier fish to the my livewell with this technique, and my partner caught two keepers too. He informed me that this was his first ever limit in a tournament, so hats off to him for that! We spent the majority of the day Carolina-Rigging, however at the end of the day I made a move, which turned out to move me right to the top of the standings. I was sitting with a little over 7 pounds with my three keepers. My last move was to flip Hot Rod Baits tubes into trees standing in 6-11 feet of water. This was by far our best depth of water on Friday. It paid off, I caught my second biggest bass of the day with only 20 minutes remaining in the tournament. I was able to upgrade to 7.70#, good enough for a 2nd place finish. Working hard on practice day led us to a great game plan on Saturday. My plan worked out, and most importantly I learned a new lake to fish...like I needed any more lakes to occupy my time. This past Saturday I was fishing at Brushy Creek Lake during a bass tournament. 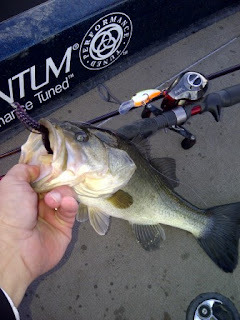 The morning started very slow, until I got a small tap on my bass jig and trailer. I set the hook and immediately tell my partner "this is a big fish!". I gave my reel a couple turns to bring the fish away from the trees and it took off towards deeper water. At that point I said, "this is no bass". I was disappointed, but now my curiosity took over, was it a big walleye? 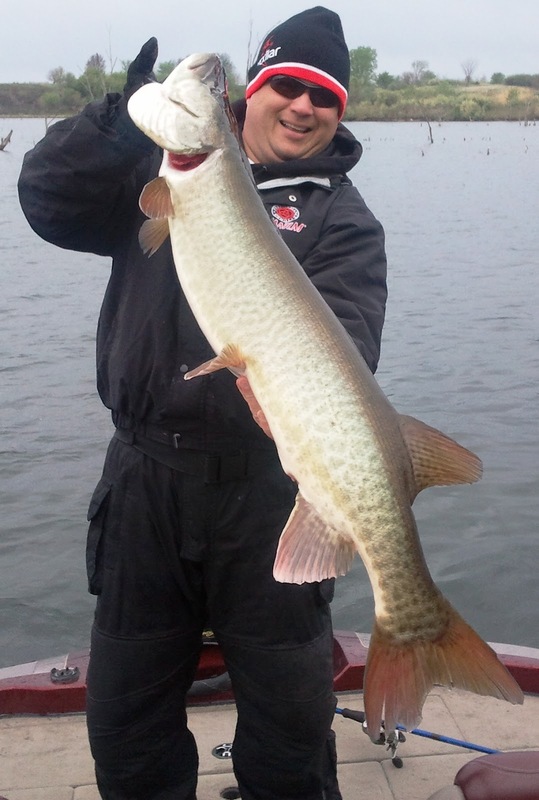 A big muskie? I kept fighting the fish, and soon it showed itself, a BIG MUSKIE! I quickly said, "get a camera" to my partner Doug. I didn't know if we would see it again or not, so wanted a picture just in case. 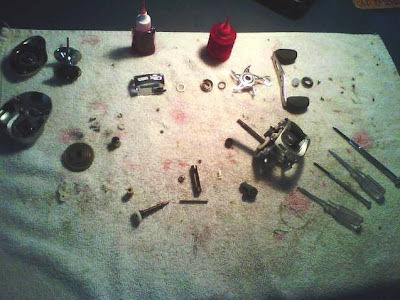 I loosened the drag a bit on my QuantumPT Accurist reel and fought the fish for approximately 5 minutes. Up and down, up and down it came. It took about 4 or 5 tries, but finally I was able to get a hold of the giant fish and bring it on board. We clicked a few pictures for the memory, and to make some guesses as to how long it was. It would have measured about 40-45 inches. I soon got ahold of my friend Thomas Allen, who is a muskie fanatic, and asked how much a fish like that would weigh, he said anywhere in the range for 20-24 pounds. A fish I will never forget. I teamed up with fellow angler Doug Chaloupek yesterday to take on the bass at Brushy Creek. I had a game plan form the weekend before, but you never know how that is going to play out a week later. We followed the game plan and had two nice keepers. In the particular tournament we were fishing a team can weigh in three keepers, so we had to find one more to give ourselves a chance. We made one last move in the final hour and it paid off for us. We caught our last keeper on a shallow hump that completed our limit. To say the least, fishing was very hard today, probably the toughest day on this lake ever for me. We ended up tied for 5th place out of 15 teams. A good start towards our goal of being towards the top of the leader board at the end of the year. There are 4 more tournaments left on this schedule, and if we can stay in the top five, we will be right in the mix of things at the end of the year. I also want to thank Doug for catching a nice walleye...which will be my dinner tonight! This Saturday marks my first bass tournament of the year, and to say I am ready is an understatement. I "practiced" at Brushy Creek last weekend with friend, Ken Lunsford. I have know Ken for years, and knew he was a good angler, but we have never went fishing together. We have swapped dozens of stories over email and in conversations, and it felt like I knew exactly what kind of angler he was. 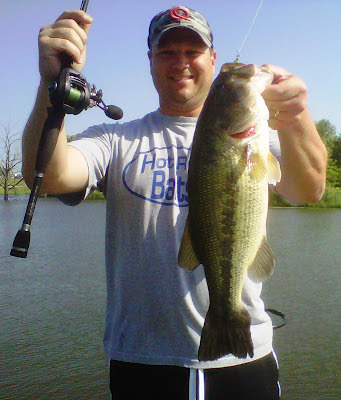 Last weekend proved that to be just right about Ken, he is a good angler and a fun person to fish with. He accompanied me to Brushy Creek in search of some clues as to where the bass were in the lake and just how far along they were on the spring bass schedule. Well, it didn't take us both very long to figure out that Brushy Creek had a curve ball planned for us. CLEAR, and that is an understatement. We could the floor of the lake in 12 feet of water at times. Neither of us planned on that or event figured it would be that clear. We were also surprised at the few number of bass we caught. I think the final number was around 7 or 8 bass. Four of them being chunky keepers and topping out at 3.5 pounds. The quality of fish were very nice to see, however the numbers shocked us. Ken helped me develop a plan for this weekend's tournament, will that plan work out? There is only one way to find out...GO FISHING! 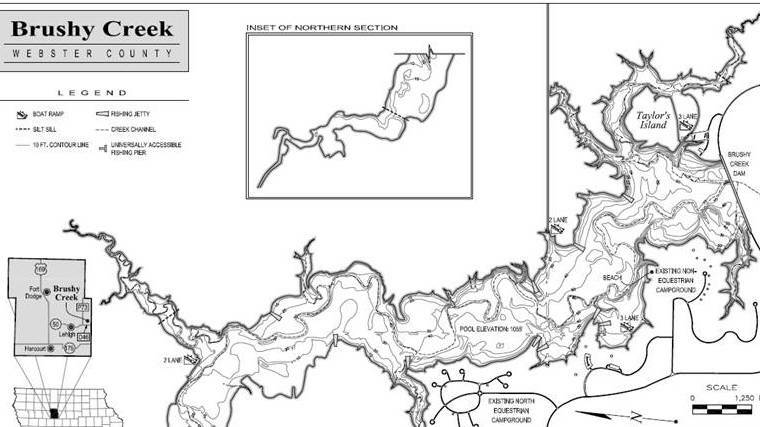 Somewhere on this map lives the winning bass for Saturday's tournament. I hope to find those fish and bring them to the weigh-in. Made it out today with good buddy, Dave Jordan. I had two goals today on the water; first and foremost, testing out my new MinnKota Fortrex 101, the second, getting some Pine Lake bass to bite. All anglers in the Marshalltown area have been fishing Rock Creek, Union Grove, and Hickory Grove Lakes, no one had any information on the Pine Lakes. Well, this made me curious, so off we headed to the north. Dave and I decided to start on Lower Pine Lake, and give it an hour or so and if nothing was cooperating, we would pack up and travel a mile north to Upper Pine Lake. We never left Lower Pine Lake, we figured them out. It wasn't automatic, that is for sure. We wasted, or shall I say experimented for about an hour before we started getting consistent bites. 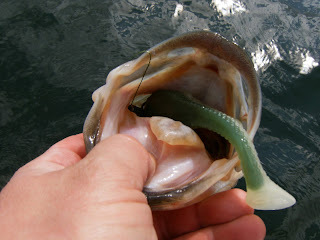 Basically, if you have a slow bait in less than 4 feet of water, you would get bites. 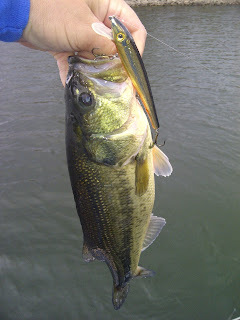 We caught many fish, including the biggest of the day, a 3.75# bass in less than 1 foot of water. Fish were holding tight to the bank, laydown logs, and overhanging bushes. In all we caught 9 keepers (15 + inchers) and 6 smaller ones on this short trip. 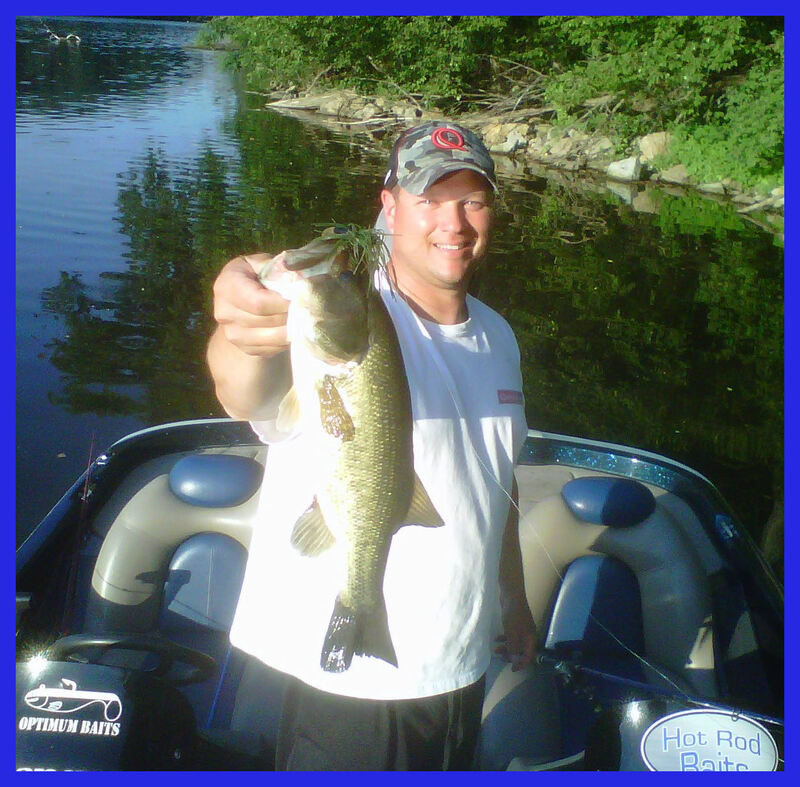 All bass came on jigs with bright blue Hot Rod Baits jig chunks or Hot Rod Baits tubes. A great day for the Pine Lakes Chain, that is for sure. Now on to goal #1 for the day. The installation of the 36-volt MinnKota was easier than I expected and I was able to do all the work the past few weeks. Today was the test. As a teacher during the week, I often struggle with grades for students and their work, however I can only give this trolling motor an A!!! 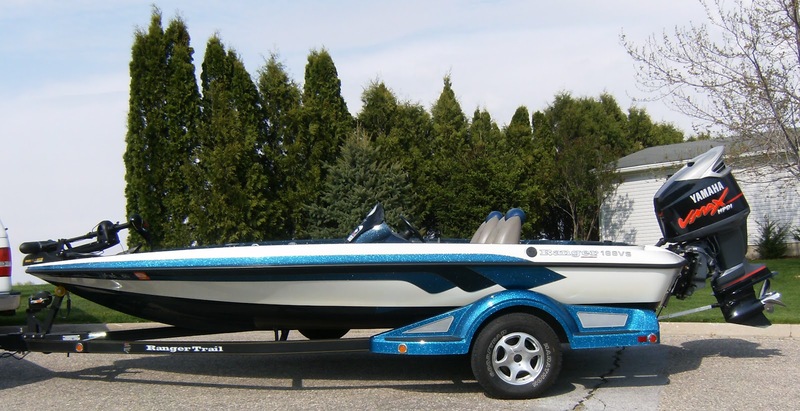 What a machine, we used it for a solid 5 hours, it is a trolling motor lake only, so it never had a break. One thing I did learn, when you turn the dial up to the maximum power...you better have yourself planted! I love it. January 29th found, David Bowles, Chad Pietig and I heading to Hickory Grove to chase some bluegills and try to find the elusive crappie in that lake. We hit the lake right at sunrise...which is absolutely awesome in its own right. With the help of Mr. GPS, we were on our first brushpile right away. To our amazement we found about 8 inches of nice ice on the lake. The bite was slow to say the least, until the sun popped over the horizon and lit things up, by that I mean lit the VEXILARS UP! We all were catching nice gills and the occasional green sunfish. The green sunfish were hanging deep down in the brush, as usual. We wore that spot out, and kept several nicer gills for David's family to eat up. We moved to brushpile number two for the day. Again, by using the GPS this was done in no time and we had a dozen holes drilled and started fishing again. More bluegills were caught but not as many. Chad even found a few gills between the brushpiles as they were cruising around. Off to brushpile number three for the day. BOOM, once again the Vexilars were flickering and showing fish immediately. This brush was in the deepest water of the day, right around 25 feet. You guessed it, more bluegills. Finally, we made our way to spot number four for the morning, this being a deep main lake drop-off. Again, the gills were there and most of them were suspended in the near thirty feet of water. Not typical of bluegills, but with our Vexilars they were quite easy to catch around the 12-14 feet area. All colors of jigs seemed to work well today, which is not normally the case at Hickory Grove. The fish that we found were fish that were working over brushpiles or on the steep drop-off looking for food. We fished a total of about 4.5 hours, so we moved when the bite slowed down, which is key at this time of year. You can catch so many more fish by being mobile than waiting in one area, especially when February is right around the corner. A great day was had by all, even though the crappies avoided us. In total we estimated at least 80 bluegills found their way up to the brisk air and sunlight that day. 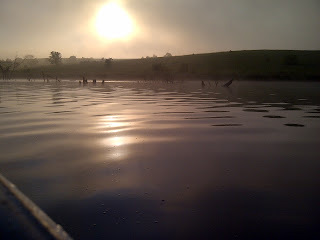 A good morning no matter where you are fishing. Last weekend was a great weekend to be outside. 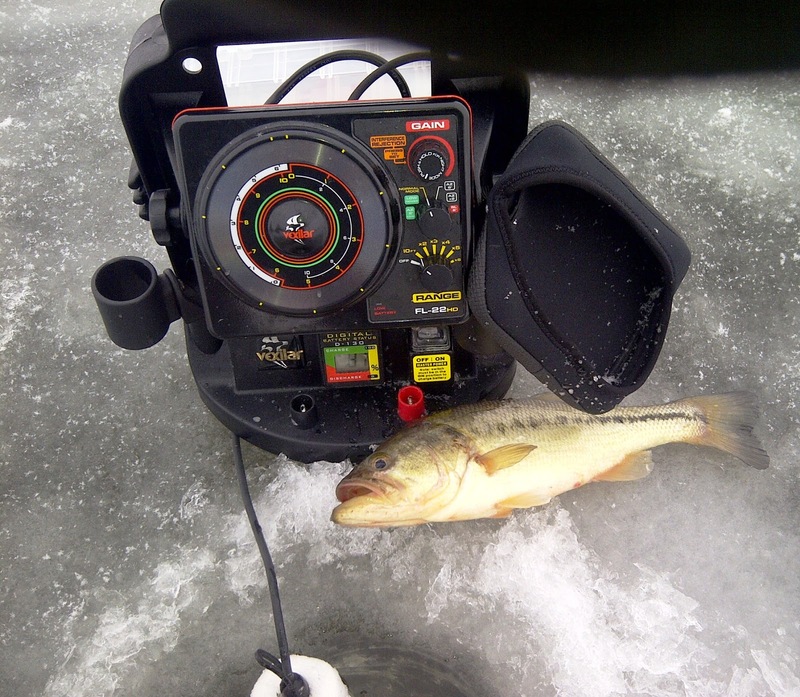 Of course, on the top of my list of “things to do” was to go ice fishing. I was invited to fish a private pond, and I thought I would share that experience with some fellow ice anglers. Three friends and I met a buddy at Casey’s from Pleasant Hill and we were off to catch some big bluegills that this private pond is known for. All five of us were excited about this opportunity as we traveled to the pond with high expectations. 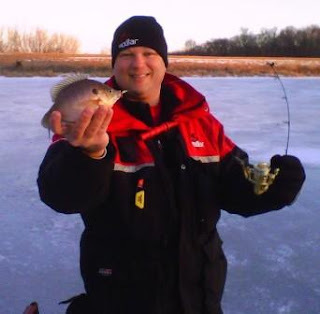 With all our safety gear and fishing equipment, we walked toward some shallow water with weeds present, a perfect location for wintertime bluegills. 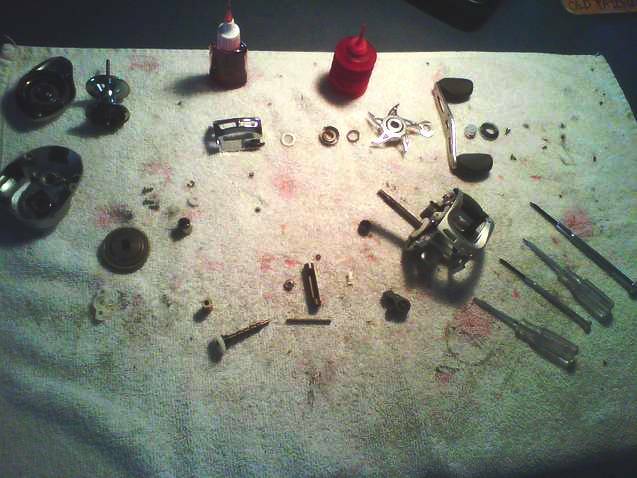 I started things off by drilling about 30 holes to locate the bluegills. In just a few minutes all five of us had our Vexilars down the holes in search of that first fish of the day. 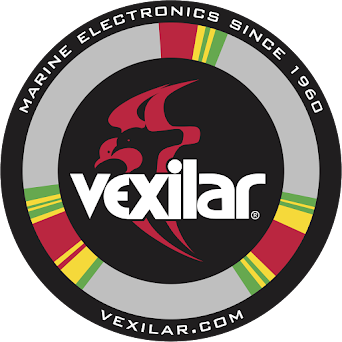 We could see fish movement under the ice with the Vexilar electronics, but they were very hesitant to bite. We all thought, that it was going to be “one of those days” when you had to practically beg the fish the bite. Well, it turns out that we were just fishing for wrong type of fish. Soon, after a quick tackle adjustment from small jigs to the larger Salmo minnow imitation baits, we were catching fish. 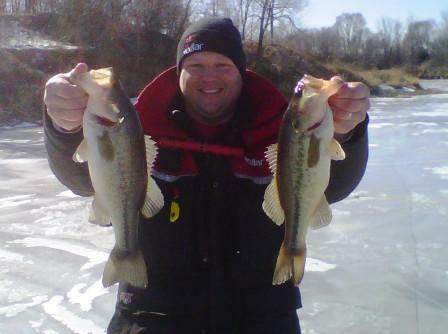 They weren’t the big bluegills that we were expecting, but what we did end up catching were largemouth bass. Every one of us were catching the bass, it had seemed like they took over this shallow part of the pond and they were keeping the bluegills out. 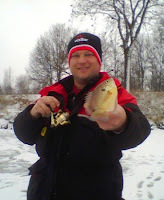 We did get a few nice bluegills mixed in, but we all had a blast catching those bass. Most of them measured from fourteen inches to sixteen inches, which makes for an awesome fight on rods that are less than two-feet long. 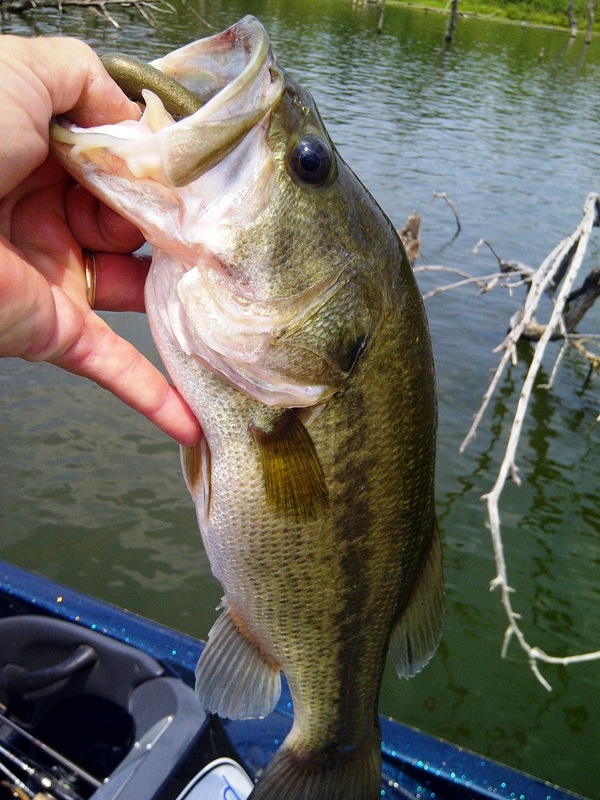 The action on the bass slowed down quite a bit, and I suggested we try some deeper water. We walked the short distance to other side of the pond near the deepest water, about 20 feet. This time Brian fired up the auger and popped about 30 holes. Once again, five Vexilars went down the holes and the catching began immediately. Most of us hooking up with a fish on our very first drop, and when we set the hook, we knew these weren’t bluegills, they were pulling too hard. The first fish on the ice was a nice black crappie. 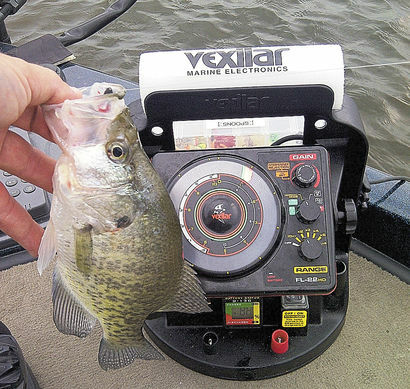 In crappie fashion, these fish came in suspended in the water column, almost exactly half way up. All five of us had a blast catching these crappies, and once again in true crappie form they came through this deeper part of the pond in schools. 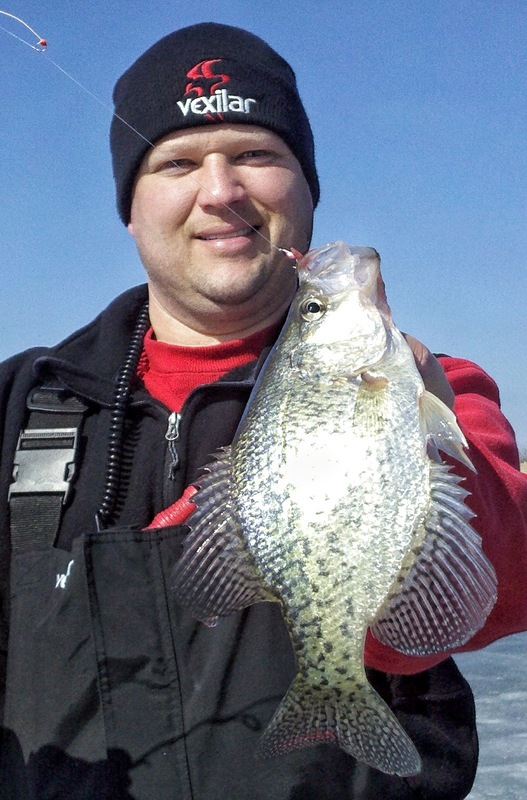 There were numerous times when two or three guys would be battling a crappie at one time. Then, of course was the battle of whose is bigger began! 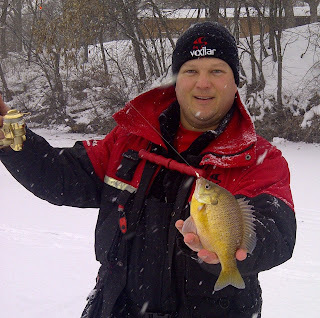 Some baits that were working well for the crappies were the standard, small ice fishing jigs, and color didn’t seem to matter. Waxworms, spikes, or plastic tails caught these fish and they were not very picky. This often happens, and spoils you when you fish a private location. Rarely are they this cooperative in public lakes where they see every trick in the book every day. One thing that I experimented with was some tungsten jigs. Tungsten is a metal that is much more dense than lead and therefore it sinks at a faster rate. This helped me to catch one fish, and get my bait back down the hole quickly before the school had time to move on. I was able to catch three or four crappies from each school when others were getting one or two, and that tungsten jig really helped me do that. If you haven’t tried tungsten ice fishing jigs, I highly recommend them, especially if you are fishing in water that is deeper than 10 feet. 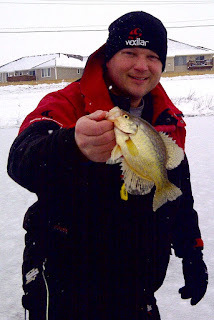 Thinking back on that day of ice fishing, I can’t help but remember the smiles of group as we were catching the bass, and then the crappies. Although it wasn’t what we were looking forward to that day, it won’t be a day that is forgotten anytime soon by my friends. Our hopes of catching big bluegills had to wait until another day, but the bass and crappies that we did catch, were amazing! Without making a move and changing techniques, the day could have been chalked up to another one of those days…when the fish weren’t biting. Plan B saved our day and made an ice fishing memory that will last a long time. Private ponds can be a blast to fish, but like I mentioned, they sure do spoil you. 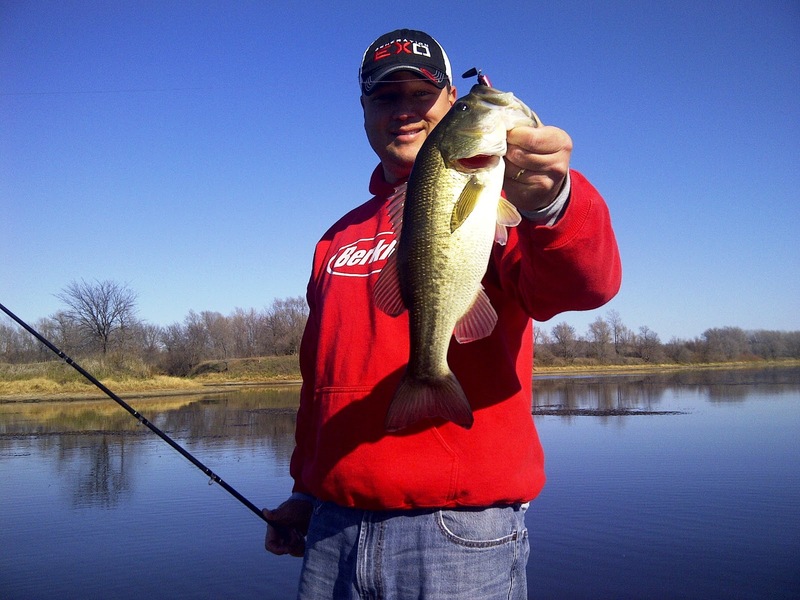 To make yourself a better fisherman, try as many different lakes and ponds as you can. With each trip, you are not only figuring out where the fish are living for that day, but also what techniques it takes to catch them. Be safe on the ice, and always take friends with you to enjoy the adventure.